One really neat thing about "The Ukrainian" is that he is really into Asian food. On the contrary, I am not so much (and I explain why in THIS post). Basically, I didn't grow up on much besides Asian food, so I am naturally a little bit tired of it and would rather not go for stuff I can eat at home when I'm out. So I really shouldn't have been too surprised when "The Ukrainian" seemed a little less excited than usual to eat dinner... at a Russian place. I, on the other hand, was pretty darn curious (and hungry). I had eaten Russian home cooking with his family on several occasions, but I figured this would be different. We saw Avenue Q, which is a Broadway musical that came to Los Angeles for just 6 days, with some friends.﻿ I won't wreck it for you, but it's a Sesame Street parody geared for adults. The musical is peppered with swearing, racism, explicit situations, homosexuality, the adult industry, post-college life, purpose, marriage, and just dark humor in general. To me, it really sent the message that things are far from perfect -- and that's just what you have to deal with in life. Yep, a far leap from the A-B-Cs. Anyway, by the time dinner rolled around, I was hungry. Someone ordered borscht, a stereotypical Russian soup, which I didn't try due to meat content.﻿ But that cheese bread that came with it tasted heavenly! "The Ukrainian," who was ordering appetizers for us like a pro (speaking to the waiter in the language of interest), ﻿got this pickled veggie assortment. I liked the tomatoes best. ﻿This was my order: vareniki.﻿ They are basically dumplings. This was a trio with three different fillings: potato, sauerkraut (something I've grown to <3 since being introduced to it), and meat. I had to inspect each one before eating so I didn't hit the meat ones. I also wasn't expecting it to be covered in this cream sauce. Had to scrape the pieces down before eating them. Kind of reminded me of ravioli in that sense. ﻿"The Ukrainian" ordered beef stroganoff. I've had a vegetarian version of this before this his mother kindly made me. Check out all the plates -- so cute! They remind me of the ones that are at "The Ukrainian" family's house! Game hen -- it was HUGE. The couple across from us could not finish it. There was a Russian deli next to the cafe, so we went in and got a slice of Russian cake to share. Unfortunately, there's no pic, but although tasty, the cake was a bit dry. Now I must get another so I can show you guys what it looks like! Overall, I enjoyed this meal even though it was hard for me to avoid meat at this place. In that regard, eating at "The Ukrainian" family dining room is much better in that regard. And honestly, their food tastes better. I guess that could be said about any home cooking, which is why I don't dine out Asian! My grandmother keeps trying to convince me and Brent to join them for russian food. It's never been high on my to-try list - and I can't decide if your descriptions make me more or less interested! Interesting, I've never had russian food! 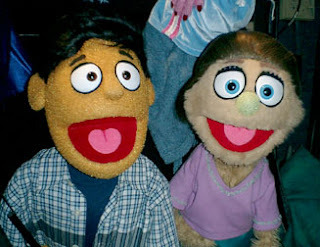 OMG, I LOVE the Avenue Q soundtrack but I've never actually been to the musical. Its awesome that you got to see it while it was in town! That play sounds really interesting. Seems it would be hard to see puppets with adult topics. I've never been to a Russian restaurant, but borscht and vareniki were relatively common eats while growing up. Been a long time since I've had either though!